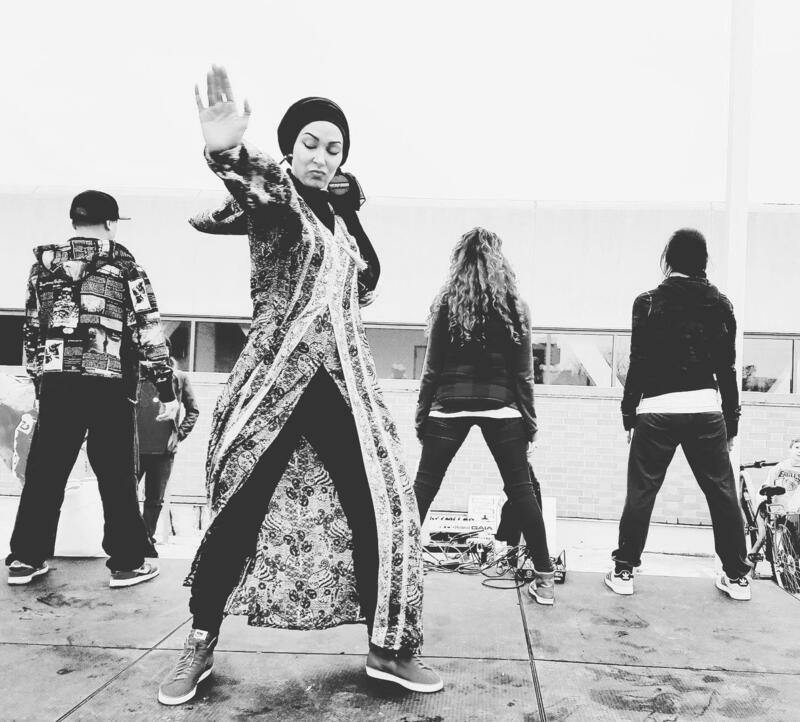 Amirah Sackett is an internationally acclaimed hip-hop dancer, choreographer, and teacher. 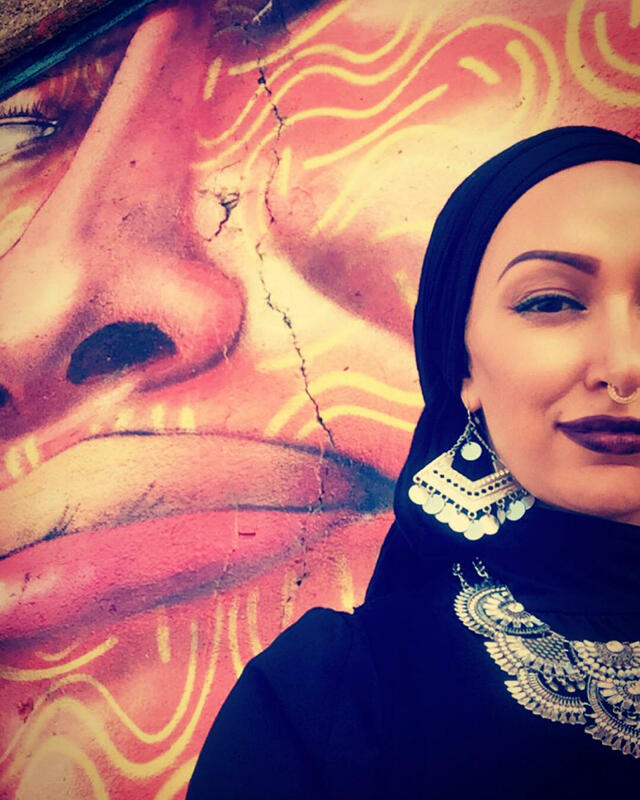 She is doing workshops and collaborating with local artists as the Artist in Residence at Shangri La, the Doris Duke Center for Islamic Studies for November, 2017. Shangri La artist-in-residence Amirah Sackett joins Hawai‘i’s Super Groupers + Keith Cross, for an evening of global hip-hop, Thursday, November 30, 2017, 7pm at the ARTS at Marks Garage. Click for tickets. See Amirah Sackett in a performance at the Sage Awards for Dance 2013 , My Fingers Feed the Fire with Modeltown, and Love Embraces All . Amirah Sackett's Tedx Talk . Check out the Super Groupers . 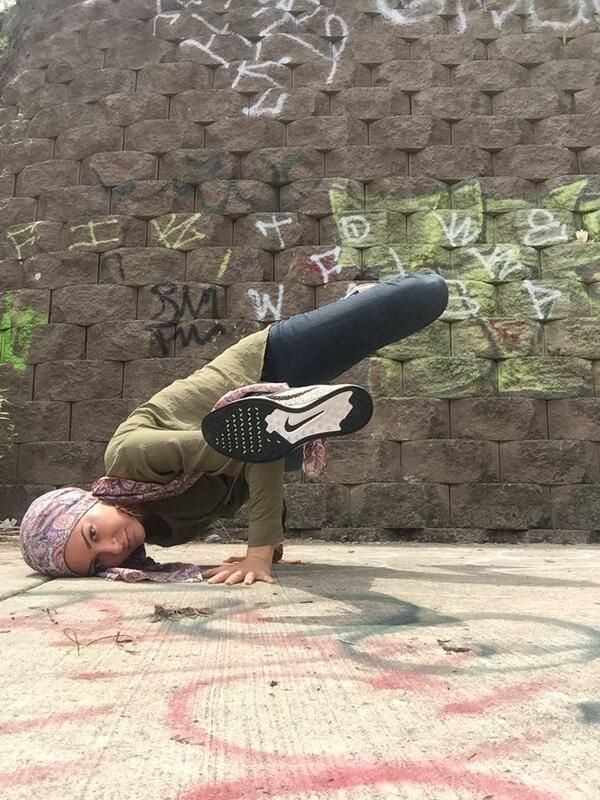 Amirah Sackett is both a hip hop dancer and a practicing Sunni muslim. Sackett: As a dancer we dance in a cypher, in a circle. When you get in that circle, it’s about the skills that you have. It doesn’t matter what color you are, it doesn’t matter how much money you have, it doesn’t matter. You’re just in there and if you get down and you are talented and gifted you’ll get props, you’ll get love from the other people. The cool thing about praying in Islam is that we pray in a straight line. We pray shoulder to shoulder, and you might be next to a taxi driver and you might be next to a doctor and you’ll be next to someone from Egypt then someone from Somalia, and you’re all praying together. At that moment in front of your creator you’re equal. I find the cypher and prayer to be a similar feeling for me. Love and unity. Sackett: That’s what I love about hip hop culture and that’s what I love about Islam is that I know so many diverse people. I know so many people from all different backgrounds because of these two things that I love in my life and I think that’s s really blessing because it gives me an insight into other people’s worlds and backgrounds. And that makes me love people. I’m a complete believer in love. Love your neighbor. In her videos, Sackett wears a diversity of outfits. 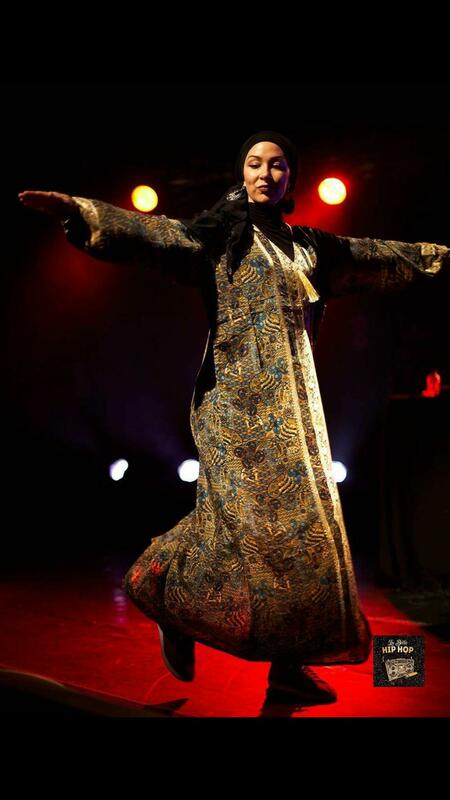 Perhaps most memorably, she does hip hop moves in a hijab and full abaya, or black body covering. Sackett has been able to support herself largely through dance and teaching, but supplements with cosmetics sales (another interest) when needed. Based in Chicago, her home town, it's a busy life, with a lot of travel. Ramadan, so that I’m not doing too much physical activity. It’s hard to be fasting all day and try to teach class when you’re exhausted. That month is about a spiritual journey and a spiritual growth so it’s kind of a different focus. And I always love that time of year because it kind of helps me get focused on my goals and resets me for the rest of the year. So I love practicing my religion. There’s so much beauty in it and that’s why I share it with people. What kinds of misconceptions do you run into, Amirah? Sackett: Oh all kinds of things. That somehow violence it taught through my faith, that women are oppressed through Islam when in fact it’s more oppression by men with all women across the globe are dealing with, as we can see with this latest scandal in Hollywood. Muslims aren’t exempt from that but it doesn’t have to do with religion. It has to do with men, and they’re not applying the principals of Islam in their treatment of women. Sackett: I think I’m part of a larger movement of Muslim that are saying, Hey listen, I’m not oppressed, I’m actually strong. I’m for women and I can still practice my faith and be a powerful woman because inherently we’re given that in our faith tradition. We are given that power. Sackett: Even the hijab, dressing modestly, the idea is that you’re not judged on your outside appearance. That is secondary to your intelligence, and your beauty comes out through your personality rather than being objectified as a sexual object. The whole purpose of hijab is to dignify yourself in public. There’s a power to that. If you choose to do that, not all Muslim women choose to wear it, they can do what they want, but when you choose to do it, you’re doing it with the knowledge that I’m doing this because it benefits me. Especially when we’re talking about being a Muslim woman in the United States, that’s what I can talk about. I can’t really talk about being a Muslim woman in another country. Sackett: For us here in the United States, you have all these women who are free to do what they want, right? I’m a Muslim woman, I don’t have religious law dictating what I can wear and stuff like that so why are all these women choosing to wear hijab and still apply the principals of faith to their life? Is it because they’re oppressed? No, it means they find a benefit in it and they find a beauty in it. That’s what I’m trying to open people’s eyes up to and just break down the barriers so we can have conversations. Do you feel you’re transgressive, doing anything forbidden by your religion and that’s part of your message? Sackett: No, absolutely not. I have no interest in breaking any rules of my faith. I love my faith and I think dance is artistic expression and that is not forbidden in Islam to express yourself artistically. The dance I do is not provocative, it’s not sexual. I do the robot, breakdance, it’s not Beyonce choreography. It’s all about intention … our religion and our practice has a lot to do with our intentions and our actions. My intention is just to do what I love and to express myself through dance. Dance is a gift that was given to me by Allah! Syrian American hip hop artist, Omar Offendum, was ready when the World Trade Center attacks thrust him into the spotlight. In the years since, he’s used his platform to build links between the U.S. and especially, the Syrian culture in which he was raised. Offendum is in Honolulu now, for a residency at Doris Duke’s Shangri La Center for Islamic Arts and Cultures. HPR’s Noe Tanigawa reports Offendum employs the raw honesty characteristic of hip hop to explore tough issues on a human level.